Chinese Muslims take great pride in citing the hadith that says "seeking knowledge even if it is in far away China." Observing the Prophet's instructions, his followers sent missionaries to China one after another. Some historians hold that, as early as the Sui Dynasty (AD 581-618) during the revelation of Islam (AD 610-632) to the Prophet, Islam had already appeared in China. 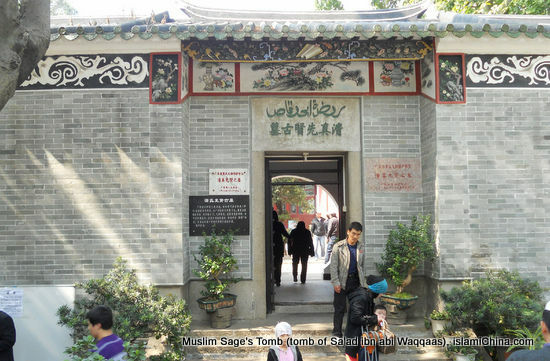 Still, many believe the visit led by Waqqaas and Qays was Islam's earliest contact with China during the caliphate of Uthman ibn Affan, the third caliph. After triumphing over the Byzantine, Romans and Persians, Uthman ibn Affan dispatched a deputation to China in AD 650. 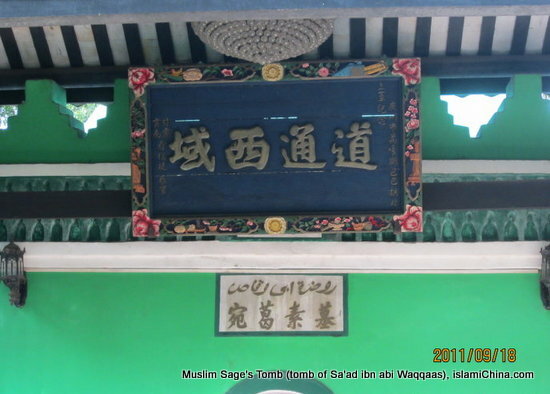 Sa'ad ibn abi Waqqaas, a maternal uncle of the Holy Prophet Muhammad paid a landmark visit to the Tang Dynasty (AD 618-907) capital of Chang'an (today's Xi'an, capital of Northwest China's Shaanxi Province), inviting Emperor Taizong to embrace Islam. 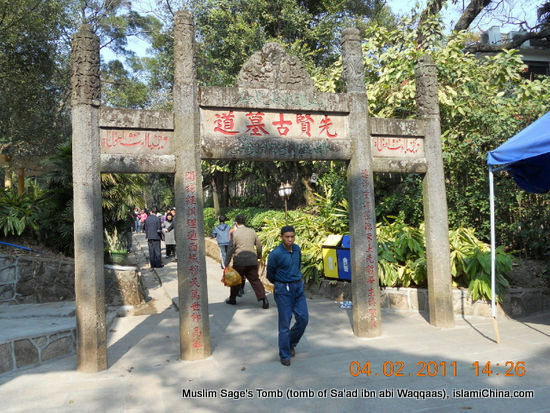 Waqqaas was said to have died in Canton (For over 500 years, Canton was known in Arabic as Zayton), today's Guangzhou, capital of South China's Guangdong Province, where he established the Huaisheng, literally meaning "in memory of the Holy Prophet" Mosque, or Memorial Mosque, one of the first Islamic buildings in China and proof of the early communication between the two cultures. 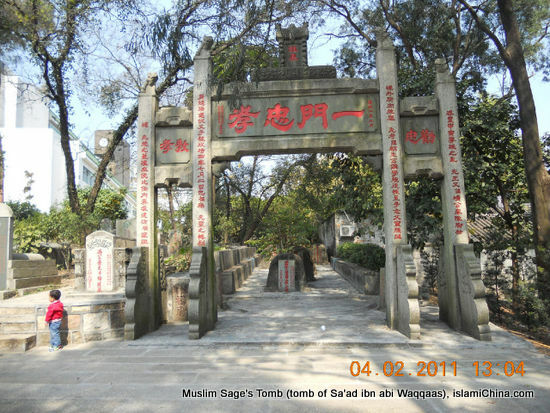 The Muslim Sage's Tomb in Guangzhou where Sa'ad ibn abi Waqqaas was buried is one of the most famous Islamic heritage site now in China. 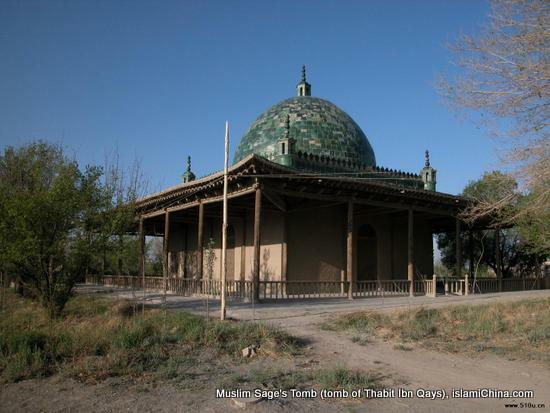 For many Muslims living in Northwest China's Xinjiang Uygur Autonomous Region, they head to the tomb of Thabit Ibn Qays, an ancient Islamic sage, located in the western part of urban Hami, about 600 kilometers east of Urumqi, capital of Xinjiang. 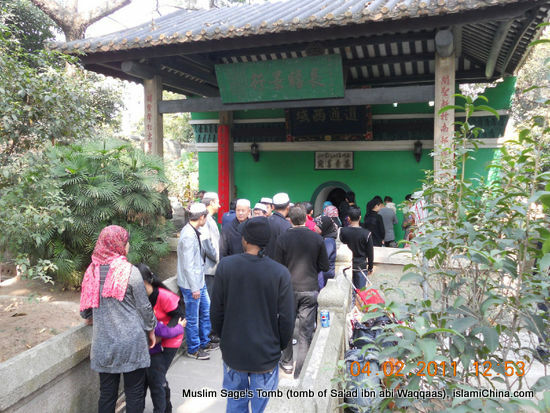 Known by the local Muslim population as "Geys' Mazars," the ancient Islamic missionary is worshiped by an increasing number of Chinese Muslims every June and July. 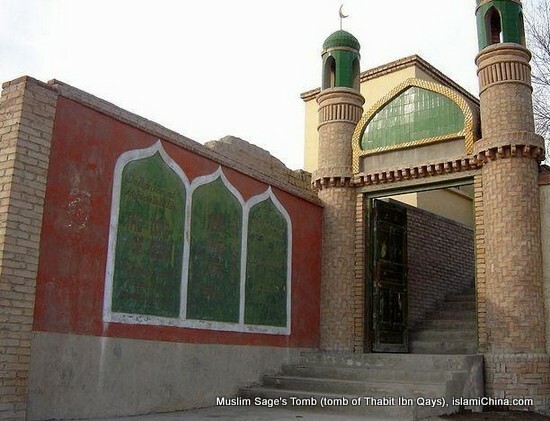 It is one of the few existing tombs of the ancient Islamic sages, known among Muslims as the "Companions of the Holy Prophet Muhammad." The tomb is 22 meters long from east to west, 12 meters wide from north to south and 15 meters high. 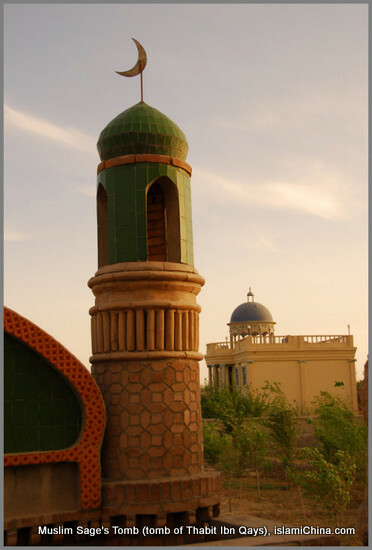 It consists of a square base, a round arched dome - both inlaid with green glazed bricks - and surrounding corridors with wooden columns and up-turned eaves, indicating a combination of both Arabic and Chinese architectural styles. Qays was believed to have died in AD 635 on his homebound trip along the Silk Road westward. He was buried by his followers in the Xingxing Valley, to the east of today's Hami. The remnants of the original tomb was relocated by Hami Muslims in 1946. 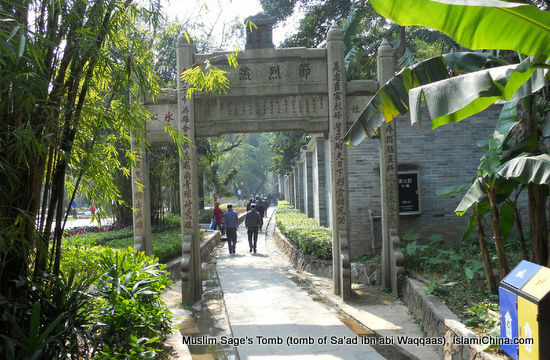 For over 1,300 years, the tomb has stood as a witness to the dissemination and evolution of Islamic culture in China. 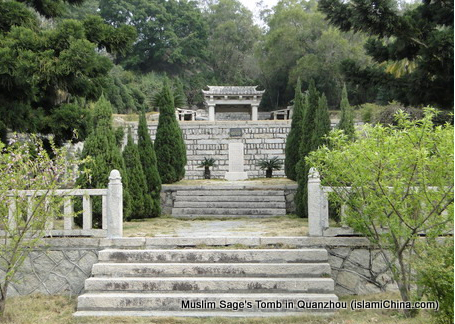 The Muslim Sage's tomb in Quanzhou is located at the southern foot of Linshan Hill, east of Quanzhou. According to the book "Annals of Fujian," from 618 to 626 during the Tang Dynasty (618-907), four disciples of the Prophet Mohammed came to China. One came to Guangzhou, one came to Yangzhou and two went to Quanzhou who were buried at Lingshan Mountain. 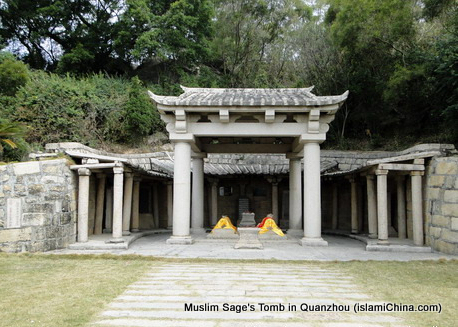 Covering an area of two square meters, the two side-by-side tombs are made of granite and have a square stone pavilion. 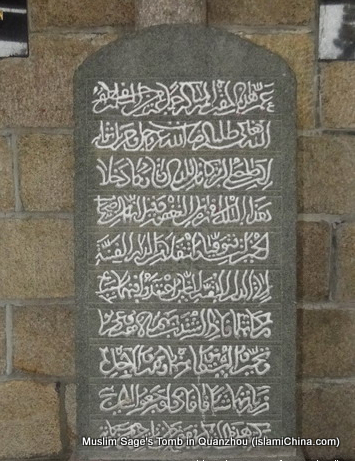 Behind the tombs is a diabase tablet erected in 1323 with Arabic inscription describing the events of the two disciples' lives. 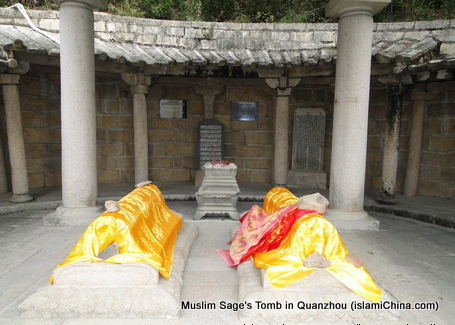 According to another tablet, in 1417, the 15th year of the Yongle reign of the Ming Dynasty (1368-1644), when Zheng He began his fifth voyage to the west, he came to pay homage to the Muslim Sage's Tomb.